I love making these blankets because they’re so easy – you can make one in just a couple of hours. 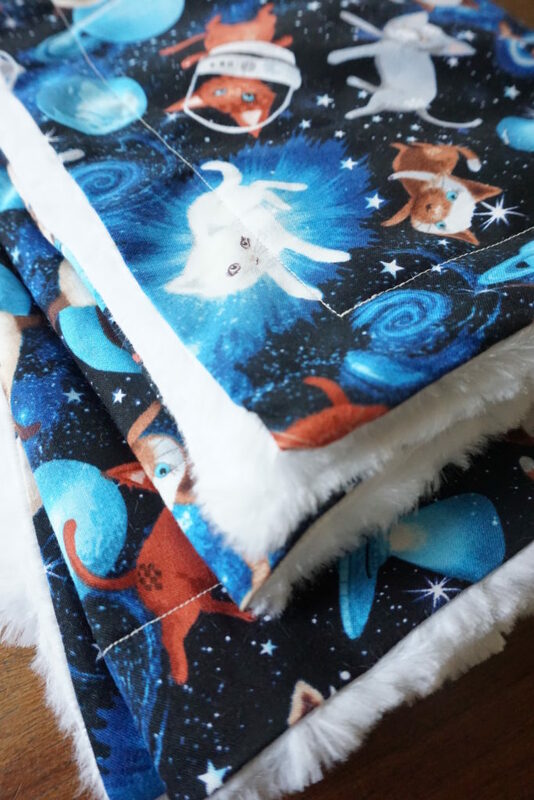 They’re the perfect baby shower gift if you don’t have time to make a full on baby quilt. The best part is they’re super soft! check out my 5-step tutorial below. Thanks for stopping by! 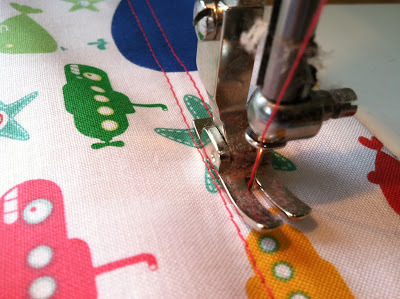 Step 1 – Trim both yards of fabric (cotton and fleece) to get rid of the selvages and frayed or uneven edges. Make sure both the cotton and fleece measure the same after trimming. (FYI, selvages are the edges of your fabric that typically have the brand and fabric line printed along it). You’ll end up trimming ~2-3 inches off the perimeter of each yard. An easy way to do this is to fold one yard of fabric into quarters. Line it up evenly on your cutting mat, and then trim the two sides that are NOT folded, as shown below. When you unfold it, the selvages and uneven edges will be trimmed evenly. 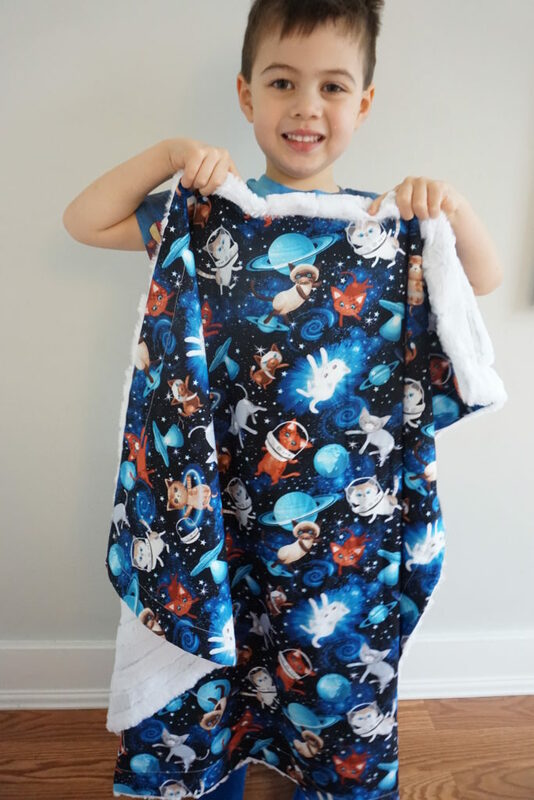 Step 2 – With right sides facing together, layer the cotton and fleece fabric evenly on top of each other. Pin to keep in place. As shown below, mark an opening (I used tape) away from the corners that’s at least 7 inches long. 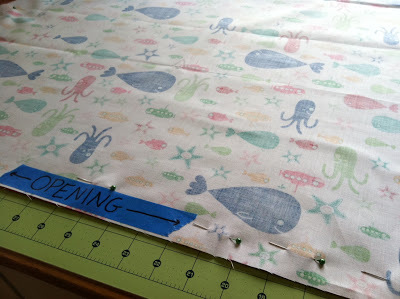 Step 3 – Using a 1/4 inch seam allowance, sew along the perimeter except where you marked the 7 inch opening. Start and end your stitch with a back-stitch. 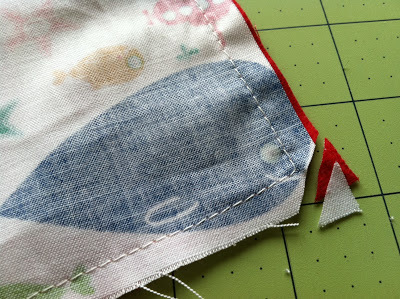 Then trim the corners outside of your stitching. 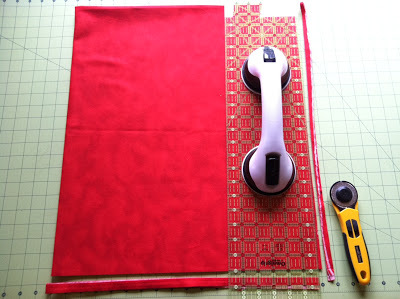 Step 4 – Through the 7 inch opening, turn the blanket right side out. Press all edges flat with an iron. As shown below, use the double-sided fusible webbing to press 7 inch opening closed. 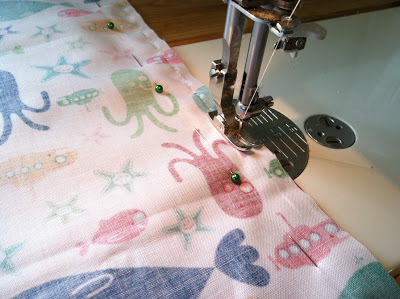 Step 5 – Using coordinating thread, sew along the edge of the blanket using a 1.5 inch seam allowance. If you don’t have a seam guider to help guide a 1.5 inch seam allowance, you can use tape as a guide. Lastly, echo that stitch by simply sewing along the previous stitch using a 1/4 inch seam allowance. That’s it, you’re done! As always, let me know if you have any questions. 59 Responses to Easy Baby Blankets! Great tutorial. Definitely a keeper! Thank you! These look great and I have several little greats that could use these. Thanks much. Another awesome tutorial… thank you so much, I will definitely do this. BTW, I love the fabrics you used, they are too cute! This is adorable! I love the fabric, can you tell me what it is? 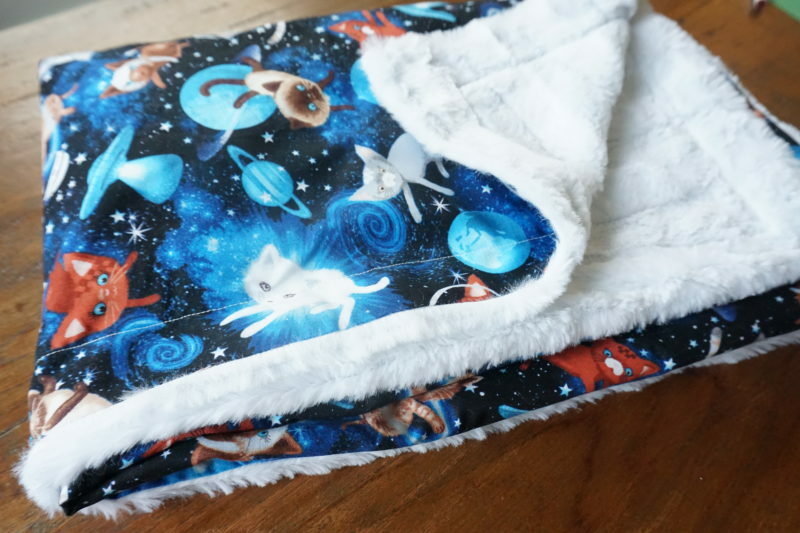 Nice baby blankets, Jera! I will make one for my sister's babygirl, cause it seems really easy to do and it may be a nice gift for some friends too! This is really cute! I'm definitely going to make some of these for gifts in the future. 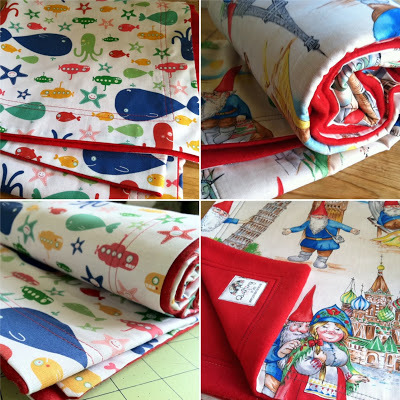 @ jabeybaby – the fabric with the traveling gnomes is called "Gnome-some Traveller" by Michael Miller. You can find it online if you search 'gnome fabric' on Etsy under 'supplies.' I don't remember where I got the ocean-themed fabric…I think it was probably by Robert Kaufman, but it's an older line. Do you think I could make one of these by hand? I am really really a beginner. Great tutorial. Thank you. Thanks for those great instructions. I might give these a try. Thanks for this. I have a baby shower this weekend, very last minute and wanted to make something, a couple of these will be PERFECT! Fantastic tutorial… Where did you get your "brand label"? 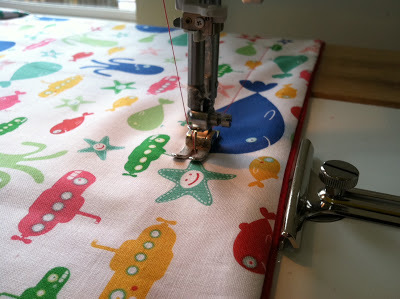 Wow those are some great looking baby quilts, I am wondering what type of sewing machine you use? Thanks for all your fun project ideas and directions. Soooo…..I'm presuming we'll be seeing some more baby-inspired creations from you in the months to come?? :))) Congratulations to both of you Jera, you're in for a fantastic new journey, welcome to 'the club'. What great and simple idea. I love it! Where do you buy your labels? It looks great. Wow – easy! 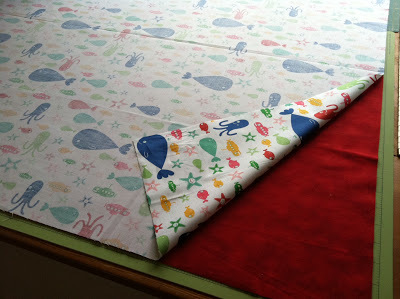 AND, it gave me the solution to my Christmas placemats I am making – double sided fusible web! Double stitch around the edge! Awesome! This tutorial helped me (a very novice sewer) make a very cute baby blanket for a friend. It didn't take me long at all…..see many more blankets in my future! Thank You!!! link in to this week’s theme of Baby Quilts! I am always looking for quick, easy blankets. I am going to start making blankets and donating them to a group that then donates them to a local hospital. Thank you for the tutorial, I can't wait to get to the fabric store! Thanks for the tutorial, so cute and looks way easy! 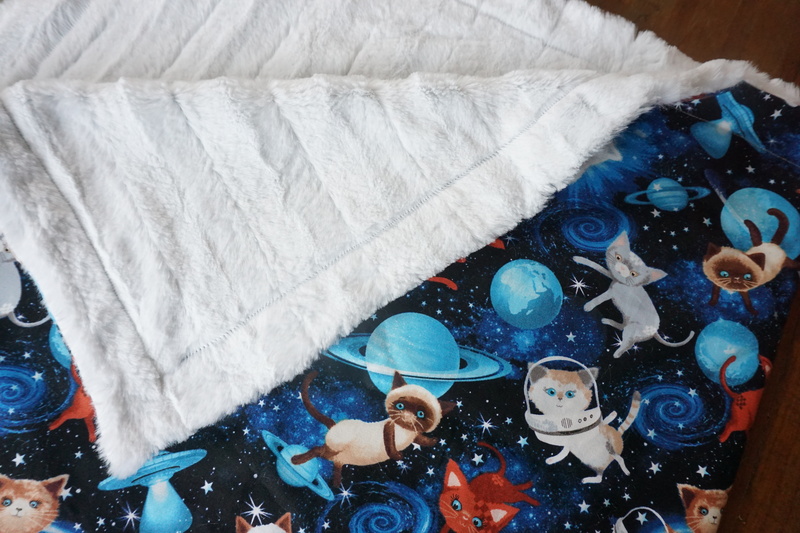 I just bought a bunch of fleece fabric by the yard so I can make blankets for my friend that just had a baby. Yay! I am also wondering where did you get your personalized label from? They really add a finished and professional look to the blanket. Thanks for the great and easy project. It's very cute. I've used flannel previously but fleece is great. it would be a wonderful item to donate. Thanks for the idea!! I did not see any batting. Could u put a piece before sewing sides. And how much small should batting be in order to avoid bunching on edging? This baby blanket does not use batting. If you want to add batting, use a low-loft batting cut to the same size as the blanket. Beautiful baby blanket! 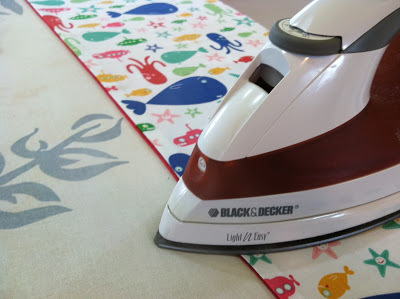 Do I need to wash the cotton fabric prior to cutting & sewing the blanket? What if the cotton shrinks but the fleece won't? I love all your tutorials but this question has not been addressed & I know I'm not the only one wondering about this: to pre-wash or not prior to cutting & sewing quilts. Priscilla, I'm also curious to hear Jera's take on pre-washing. I've been quilting for 2 years and was taught to always pre-wash…so that's what I've done. Only one of the 20+ quilts I've made over that last couple years has called for un-washed fabric. I hope this helps… I found a family owned fabric store in my area where they give quilting classes & I ask an instructor there & she does not pre-wash her quilting fabrics(good quality) & she uses a "color catcher" if her quilt has any dark colors (black, red, purple, etc…) or dark batik fabrics. Happy quilting! Thanks Priscilla! I am a very thrifty quilter. With that being said, I usually buy my fabric at Goodwill (everything is 50% every other Saturday!) I've accumulated quite the stash buying my fabric this way. Obviously I'm not too particular about specific fabric, it just has to be cotton and low priced. Most of the time the fabric is brand spanking new but I still wash it regardless. I have used color catchers though, and they are fantastic! Zenia, I didn't know Goodwill sold fabric, thanks! I got to check it out! Yes, I'm finding out that buying cotton fabric is expensive! Quilting is not cheap. Are you on Pinterest? I'd like to see what you've made so far. Follow me on Pinterest and check out my My Quilts board. I just joined & need to learn how to post. I just finished my very first baby quilt this past weekend & it turned out beautiful! It's a strip quilt I made for my niece's baby girl. I will find out how to check your quilt board. Thanks! Jera, I made one of these last night. It took a little over an hour. It turned out so cute. Thanks for this super simple and quick tutorial! These are perfect for baby shower gifts! They looks really simple, oh how I wish I could make the same with the smooth end…. But good thing I overcome it. I love the tutorial and very easy to make. Great !!! This is so phenomenal!! !That is very impressive! Blankets & Quilts are gorgeous and the makeover is totally amazing. I love it. You really did a super job with the Blankets & Quilts! I use to do buy online Blankets & Quilts as its time saving. I'm still unsure whether to wash the fabric first. I have never washed it first! I think the cotton would definitely shrink some but the fleece will not. So I'm assuming that the cotton needs washing???? What is the solution? I'd love to know this answer also. I hear both yes and no – obviously. from the best sewers. Have you quilted /stitched the fabrics in the middle at all to hold them in place or kjust the edges? It almsot seems too easy. Thanks for sharing. Babies like that softness. Hi. I love how easy this is and can't wait to try it. One question….is there any concern about the fleece melting when ironed? Today, I read post and I made one of these last night. It took a little over an hour. How about putting in some batting? This quick baby blanket/quilt. Is great for giving to various groups. My sewing group just had a baby shower for Bella house for pregnant women. So many charities would love your help. I bought cotton clothing from the thrift shop and cut it to make many quilts. Read the labels….fabric has gotten so expensive especially for seniors on a fixed income. Many sewing groups provide the fabric if you sew for charity. 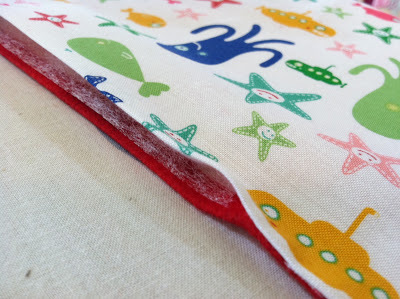 I love to sew these for baby gifts….nice tutorial , thank you. How about making one a little larger to be used as a lap quilt? My aunt made one for me when I went to college and I still have it. That was fifty years ago!. It has been well loved not only by me but my children and now, grands. I don’t have babies anymore but I do have teens and young adults who love to cover up with a little bit of love from their Nan.